It’s just after 7.15pm as we enter the corridors of the old Girls School in East Perth and the fading light that filters in through art-deco gridded windows lends an eeriness to proceedings. This is “In SITU”, Perth’s annual season of site-specific works from local independent choreographers and composers. In keeping with former incarnations of this program, producers Emma Fishwick and Kynan Hughes present 2018’s “In SITU” promenade style, but this time it feels particularly adventurous. While the 1930s Girls School building is currently in use as a cultural space, it has an air of abandonment that creates a sense that we are on an expedition into the unknown. Framing the program is Serena Chalker’s evocative installation, in-passing. As we travel from one performance space to another, we pass fragments of memory, moments of homage to the building’s former uses, first as a school and then as a police station. Text books are wedged in the wooden locker, a school uniform hangs in an alcove, incident reports cover a desk, a light-bulb hangs from gallows. 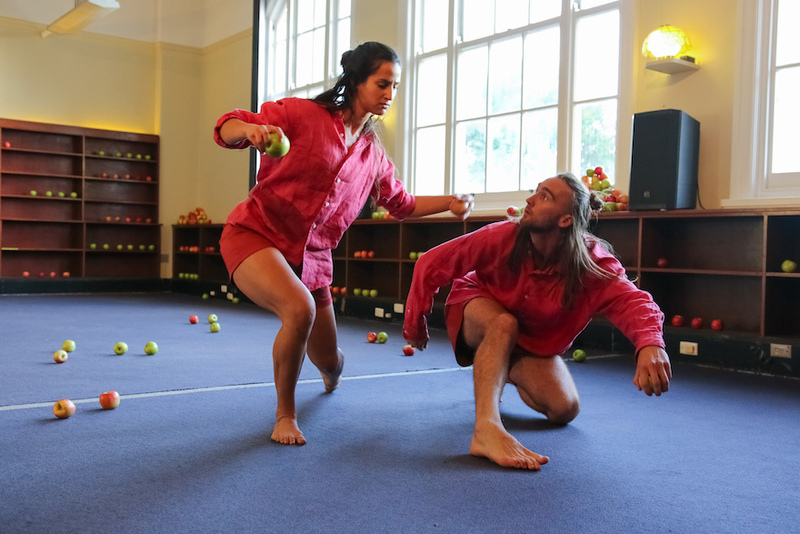 The first stop on the walking tour is a small office-carpeted room for Apply Within, choreographed and performed with punch and zest by Sarah Chaffey, Mitchell Aldridge and Melissa Tan. With its clever use of projection to imply a second performance space, Apply Within is a witty exploration of the interview process. Clad office attire teamed with boxer shorts and socks, the three dancers reveal what lies beneath their game faces. They’re accompanied by Ryan Burge’s score, that ranges from discomforting white noise to dance-style electronica. Now they move together; perched on three chairs they twitch and soften in synchrony. Now they’re solo; Aldridge pouring across the tiny space, Tan climbing the windows, crabwise, Chaffey shimmying through a presentation. 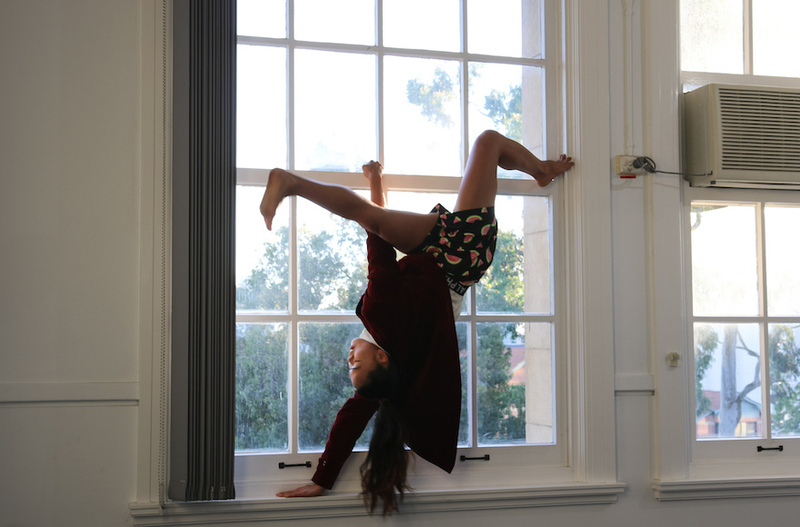 Melissa Tan, climbing the windows. Photo: Emma Fishwick. Stop two takes us into a large room lined with wooden shelving, on which sit rows of apples; their fresh scent lightly perfuming the air. This is May Greenberg’s How to Digest an Apple, a duet performed with grace and energy by Greenberg with Mitchell Harvey. Their movement is sometimes robotic, as apples are sorted; sometimes weighted, as though the apples are heavy in their hands; sometimes wild, causing an apple cascade. In Dane Yates’s electronic score we can hear vocals; repetitive, distorted. Our third stop, in the building’s basement, is also scented; sweet and cloying. 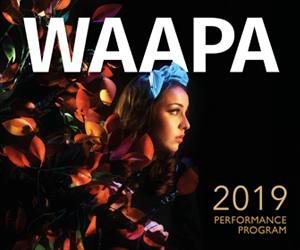 In There’s a redness in the west, blood on the moon, fire in the sky and it’s coming this way, dancers Dean-Ryan Lincoln and Tahlia Russell lead us through a series of rooms and soundscapes (by Steve Paraskos), the echoes of which create ghostly underlayers. Whether performing in the gaping space of an underground bar, a discomfortingly cramped cellar-like space or a room flooded with dead leaves, the dancers negotiate one another with a wariness that seems to battle with a desire for closeness. While this work isn’t as succinct in its motivation as the first two, both concept and performance are dramatic and engaging. Grace and energy: May Greenberg and Mitchell Harvey. Photo: Emma Fishwick. Finally we move outside, looking towards a flight of steps that leads to the building’s main entrance. At the top of the steps, two dancers hang, their torsos obscured by crimson skirts, only two hanks of hair visible to give a sense of their identity. This is Sisters Vice, created by Natalie Allen in collaboration with endearing performers Ella Watson-Heath and Sarah Sim. The two young women ricochet between adulthood and childhood, chasing one another with screeches of delight one minute, seductively sliding down the bannisters the next. Rebecca Riggs-Bennett’s score also straddles the divide; playground giggling contrasts wordless vocals. And so, the end. As we leave the precinct, we glimpse a figure in school uniform (Serena Chalker) drifting ghost-like down the corridor. It’s time to return to the present. Whether your interest is in dance, music, architecture, or simply a desire to lose yourself in another world, “In SITU” is an intriguing and appealing walk into the unknown. Highly recommended. “In SITU” plays until December 1.